According to Steve Roper's "Climbing Guide to Yosemite Valley"FA: Tom Kimbrough, Tom Hargis and Roman Laba, 1965. FFA: Loyd Price and Roger Gordon, 1967. 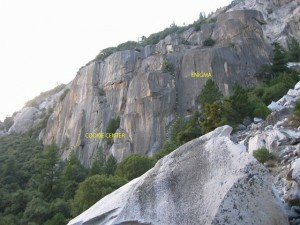 From a notch between the Cookie and an outlying boulder, climb up cracks for a short pitch, then climb a prominent jamcrack which leads into the open book forming the right edge of the slab. Climb this book to the top. Which SuperTopo guidebooks include a topo for The Cookie, Center Route?